Engel, Susan 2016. Curriculum reform: a transformation or consumption model for politics and international relations?. Australian Journal of Political Science, Vol. 51, Issue. 3, p. 555. Ackerman, Erin and Arbour, Brian K. 2014. “From Library to Learning: Teaching Students to Use Scholarly Research.” Presented at the APSA Teaching and Learning Conference, Philadelphia, PA, February 7–9. Auerbach, Arthur. 2014. “Constructing a Research Internship Program as a Means of Promoting Experiential Learning.” Presented at the APSA Teaching and Learning Conference, Philadelphia, PA, February 7–9. Ault, Michael. 2014. “Teaching Research Methods using Synchronous and Asynchronous Online and Hybrid Approaches.” Presented at the APSA Teaching and Learning Conference, Philadelphia, PA, February 7–9. Bertrand, Julia Lau. 2014. “Follow-Through in the Research Methods Curriculum: Reinforcing Research Skills through Teaching Continuity.” Presented at the APSA Teaching and Learning Conference, Philadelphia, PA, February 7–9. Daigle, Delton T., and Stuvland, Aaron. 2014. “Teaching Research Methods across Delivery Modalities - An Introduction to a Research Design that Compares Large Classes, Small Classes, and Hybrid Distance Offerings.” Presented at the APSA Teaching and Learning Conference, Philadelphia, PA, February 7–9. Dopp, Kathy Anne. 2014. “How to Empirically Corroborate a Causal Inference: What is Missing in Political Science Education?” Presented at the APSA Teaching and Learning Conference, Philadelphia, PA, February 7–9. Guo, Gang. 2014. “Using International Statistical Data and Excel in Teaching Introduction to International Studies.” Presented at the APSA Teaching and Learning Conference, Philadelphia, PA, February 7–9. Kilbur, H. Whitt. 2014. 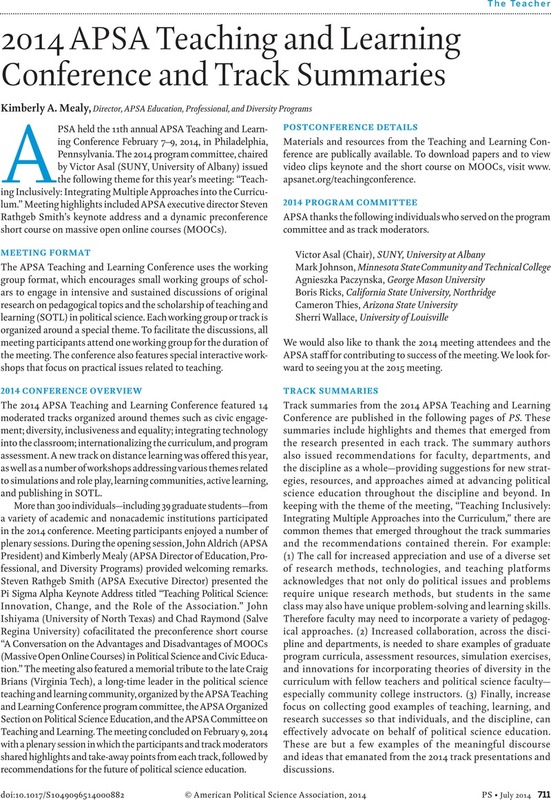 “Teaching the Political Science ‘Brand’ through Scaling Analysis.” Presented at the APSA Teaching and Learning Conference, Philadelphia, PA, February 7–9. McGuire, Mary P. 2014. “Beyond Statistics: Introducing Qualitative Research to Political Science Undergraduate Students.” Presented at the APSA Teaching and Learning Conference, Philadelphia, PA, February 7–9.